New photos and video tour give an insight into the vision for the new Liverpool Central Library as it heads towards its May 2013 opening. 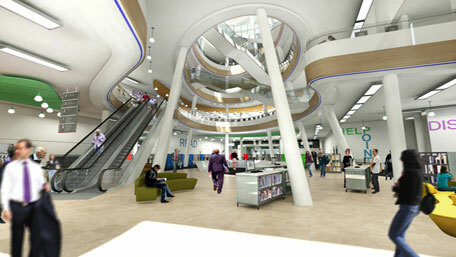 The library is expected to attract a million visitors in its first year, double previous usage. 'We want it to be a visitor destination in its own right,' says Joyce Little, head of libraries. Work began in 2010 on the £50m refurbishment and restoration behind the Vistorian facade. A month-long literary festival is planned to mark the opening and to showcase the city's thriving talent. The topping out ceremony celebrates a milestone for Liverpool Central Library as it heads towards its Spring 2013 reopening. Photo gallery on the BBC website.